When I am very short on time and feeling rushed to put a lunch together quickly I invariably grab for the four square Lock & Lock box. It is just so easy (and fast!) to pack up each section. Clockwise from top left: cereal bar (cut in half so it would fit in the compartment), cheddar cheese with jack cheese flower inserts & Wheat Thins, chopped kiwi fruit, clementine orange segments. 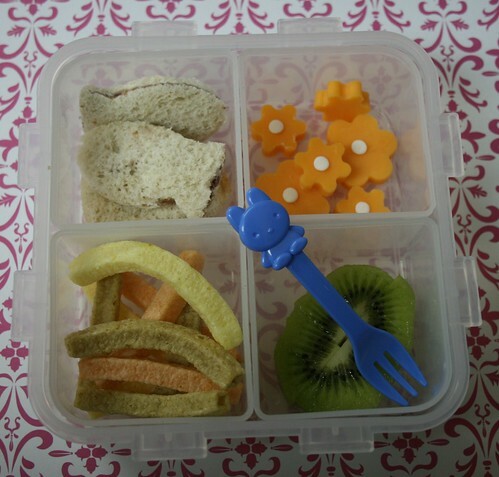 Note the cute little picks in the fruit compartments, that's a dead give-away that this bento was for my 2nd grader and not my two-year-old. 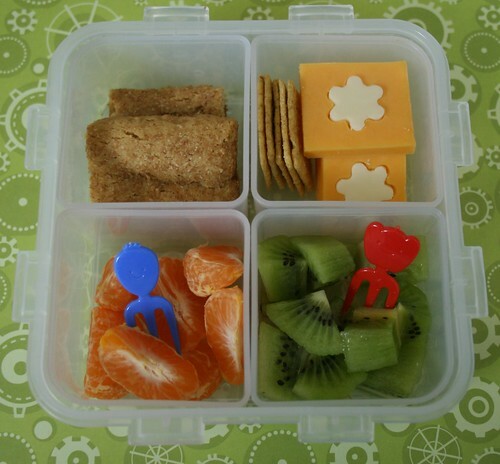 :) He's my pickier eater who shuns sandwiches, so cereal bars make for a substitution in many of his bento lunches.